We've been married for 37 years and have always enjoyed vacationing by the water. When our children were young we decided to buy a home that would provide a fun retreat for our family. We lived in Raleigh when we bought the house and it was an easy drive. When we had to relocate, our first priority was to make sure we still lived close enough to Lake Gaston to enjoy our family time there. Location, location, location! One of the reasons we chose our home is because it has lots of waterfront on Lizard Creek, yet it's right around the corner from the main lake. Plus the house is very close to the dock and boathouse...it's fun to look out window and watch family and friends fishing off the dock. It's also neat to join them by sitting on the dock swing, especially in the evening while watching the sunset together...what a life! The house is on a level lot and the water is very close. Great for young children - there is even a small sandy beach area. You'll find out how to access it by looking in our lake notebook located in the kitchen. Our living room is very large and has a wonderful view on the lake. There is a video/DVD library, plus puzzles and games in the shelf/cabinet unit. You can also enjoy stargazing with our telescope! We keep dishwasher detergent under the sink. We have a toaster and a toaster oven. If you forget anything, not a problem, because Food Lion is close by. All dishes, glasses and silverware are provided. (2) We have two TV's...one in the family room (55 inches) and one in the master bedroom. We have many DVD's and videos to choose from. They are located in the family room on the shelf unit. There's a library of books located in the master bedroom bookcase. There are games located in the family room cabinet. We have a CD player and the TV has music channels. There are puzzles and games located in the family room cabinet. We have many DVD''s and videos to choose from. They are located in the family room on the shelf unit. The large deck has a table and a set of chairs. This was our third time staying here and have enjoyed every time - is there anymore to say? I really can't say enough about this house or the owners - both are terrific! Each of the three bedrooms has access to the deck and a beautiful view of the lake 😀� Something many may not consider is the topography - the lot is level which provides easy access to the dock - much better than hauling everything up/down 100 steps! The house is located on Lizard Creek which is a wonderful place to tube/ski and has calmer water than the main lake. The house itself is well furnished and have never needed anything but it is a rental and if you have specific things you use I would advise bringing. The house also has a full size washer and dryer - have not used them but it's nice to know they are available. If you plan to visit Lake Gaston I would consider staying here! This is a great lake home. Very comfortable with a great view you are on top of the water. 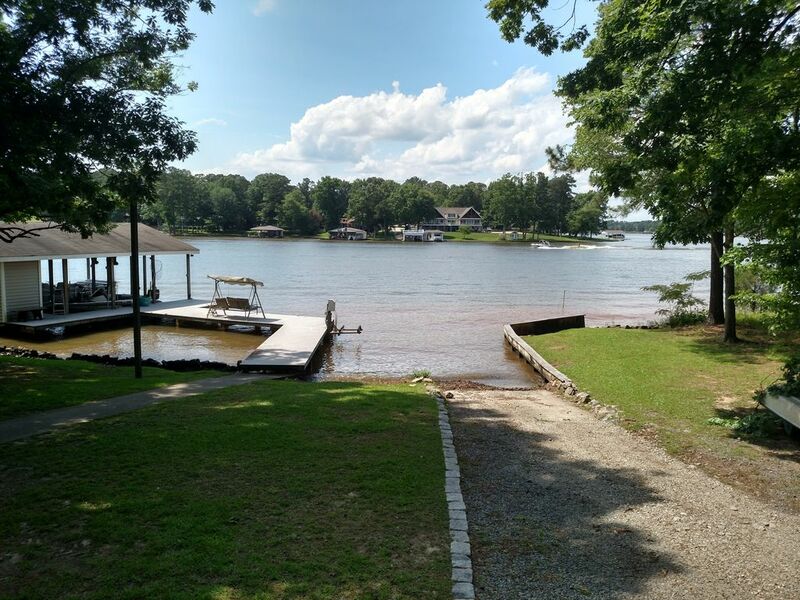 This home is in a very good location only minutes from Food Lion and numerous gas stations on the lake. Owners are very easy to communicate with and have anticipated all the vacationers needs. The boat ramp on the property is supper convenient loved everything about this lovely home. We absolutely love staying at this house. It is very private and has all the accommodations that you could ever want on the lake house. We had the best relaxing fun vacation so far. Look forward to coming back next year. The most relaxing vacation. No stress other than which bathing suit to wear today. It is a great! The location on the lake is perfect. 2nd year staying here. Plenty of room, pretty well stocked kitchen (could use a couple more 9x13 pans), would love to see some pier furniture and also some upgrading. We are ready to book for next summer! We spent a week in July at this property and it was wonderful! Spacious, everything we needed for cooking, wonderfully shadded large deck and just a beautiful view! Short and widely paved side walk to the dock which was fantastic for my daughter who has special needs. Walking uneven steep terrain is challenging for her but this allowed for easy access to the lake. (It's the small things that make a huge difference) it was private enough so that you could enjoy jumping in and having space to swim and float around but still just close enough to watch all the boats and jet skis. Very relaxing and inviting and comfortable. Large livingroom for family games and dinning table so that we could all sit down together and enjoy our meals. It was special to sit on the dock on the swing in the evenings and talk with my son (who is leaving for his first year of college next month) laughing at old family stories and talking about what's to come. I highly recommend this property for anyone looking to have quality fun family time! The owners were very kind and made themselves available for whatever we might have needed. We all had wished we booked for two weeks by the weeks end! A lovely home, a fantastic vacation and another family trip of memories in the books!!!! My wife and I spent 7 wonderful days at the lake. The house was exactly as described. It was very clean and spacious. I really liked that it was so close to the water with a gentle slope to the water. In the picture the boat ramp looked small but it was plenty big enough for my 20 ft pontoon boat and easy to maneuver. Everything in the house worked as it should. Not a lot of channels on the tv but that was not a problem we spent most of the time on the boat or on the deck. We will be back soon I hope. Knee-boarding, Wake-boarding (lessons available from Adam Fields), Bingo, Flea Market, Feed the fish and ducks at Morningstar Marina. Lakeside Mini Golf on River Rd...perfect family entertainment! Lots more activities and information listed in a large 3-ring binder located in the kitchen. During the peak summer months we rent from Saturday to Saturday...arrival time is 4pm and departure time is 11am. We accept shorter rentals over the Memorial and Labor Day weekends. We will also consider shorter summer stays (3 night minimum) when a full week hasn't been rented and it is getting close to the arrival date. During the off-season we accept a 2 night minimum.